The WolfPack women’s volleyball team took part in a tournament in Edmonton to start off their 2018/19 pre-season. TRU lost all three games but were involved in two five-setters. The pre-season always serves as an opportunity to get some match fitness and get some reps.
On Sept.14, the pack lost in five sets to the tournament co-hosts, the University of Alberta Pandas. Despite having lost the contest TRU will be at least a little satisfied for pushing the contest all the way and competing hard with quality opposition. 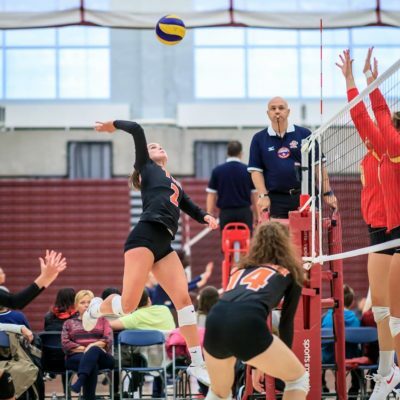 On Sept.15, TRU lost in five sets to the defending Canada West champion University of Calgary of Dinos. The score was 22-25, 25-23, 24-26, 25-14 and 15-11. “Overall, I was happy with the way that we competed,” said head coach Chad Grimm to TRU Athletics. “The last three sets we rolled with all our first-year players. They kept the ball in play and started to make decisions. I think our team grew up pretty well this weekend. I think we got tougher. That was a good sign,” Grimm added. TRU has also hosted some exhibitions which included three Albertan Universities: University of Alberta Pandas, MacEwan University Griffins and Mount Royal University Royals. The University of British Columbia Thunderbirds and the University of British Columbia Okanagan Heat were also in attendance. The team has also been involved in charity events around the city. The women’s ’Pack volleyball team attended the scholarship breakfast where local businesses and members of the sporting community came to listen to Olympic gold medalist Kelsey Serwa, who is a Canadian freestyle skier. The volleyball team also took part in the “You can play” initiative. The initiative ensures the safety and inclusion of all sports including LGBTQ2S+ athletes, coaches and fans. They were also involved in the Terry Fox Run on Thursday Sept. 27. The event involved a number of Kamloops schools, athletes and local community members. With the season just a month away the team will be looking to continue improving and getting into perfect condition for the upcoming season where they will be hoping to reach the playoffs and beyond. The season opener is Friday, Oct. 23 on the Warner Rentals Court at the Tournament Capital Centre as the ‘Pack hosts the UBC Thunderbirds.